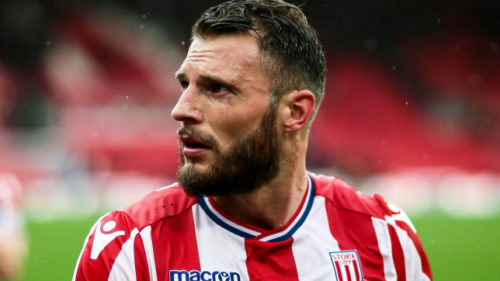 Stoke City defender Erik Pieters has been fined £70,000 for an unauthorised night out with his wife Nermina Pieters-Mekic over the weekend. According to a report by Daily Mail, Pieters hit a night club with his better half just hours before Stoke City’s 1-2 defeat to Everton in a Premier League tie on Saturday. This despite the club manager Paul Lambert restricting players from going out a couple of days before a match, something that Pieters disobeyed. Consequently, the 29-year-old was dropped from the match that his side went on to lose, thanks to a second-half brace from Everton forward Cenk Tosun. “Erik is a very experienced player so we were extremely disappointed with him for going out before such a big game,” the report quoted Stoke City chairman Peter Coates as saying. “We expect professionalism from all our players and Erik badly let us down on this occasion,” he added. The loss added to Stoke City’s woes as they are placed second last in the standings and run the risk of being relegated from England’s top-level event. They are next scheduled to lock horns with Arsenal come April 1.